On many occasions our customers have requested service to spray their yard for little black ants creating mounds throughout their lawn. After identification and a thorough inspection, we have found the little black ant in question to be the pavement ant. Pavement ants are small (1/8 to 1/6 inch long) reddish brown ants commonly seen along sidewalks, concrete pads, pavement driveways and throughout lawns. Another visible distinguishing feature are the parallel lines or ridges on a Pavement ant’s head that give it a grooved texture look. Pavement ants form large colonies with over 10, 000 workers and often two or more queens. Pavement ants are common throughout Delaware and Maryland. Nests are mainly found on the exterior of homes but at times have been a nuisance pest inside as well. Throughout the Delmarva area we find pavement ant nests in areas with minimal vegetation and loose sandy soil. Often, Pavement ant entrance mounds can be found in non- established turf lawns in addition to adjacent to pavement or concrete driveways. Pavement ants feed on dead insects, pollen, fruit, sugar, other sweets and greasy foods. Like many other little black ants, pavement ants enter structures through small cracks, gaps around doors, windows and any poured concrete slab. Once a food source is discovered worker ants will follow a pheromone trail to harvest the food material and feed the colony. In a heated structure winged reproductives (flying ants) may emerge anytime of the year but Pavement ants typically swarm in the spring. 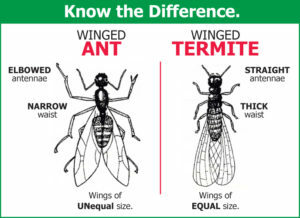 Customers calling that they are in need of a “bug guy” to come out and spray for little black ants or sugar ants often find that after identification and inspection their pest ant problem is a Pavement ant infestation. Like other pest ants, the key to elimination is inspection and positive identification which cannot be done over the phone. .
After identification, pavement ant elimination starts with eliminating all the cracks, gaps and entry points. It is common to see small soil particles and sand piles in structures near cracks in concrete slabs. Often our technicians will note small sand debris piles along the interior baseboard adjacent to a concrete porch slabs. . Specializing in ant control, we have found that treating pavement ant mounds in the yard is futile, since pavement ant nests are located very deep. Pavement ants are very resilient, so treating pavement ant entry mounds is seldom affective. To treat or exterminate a pavement infestation, the nest location must be taken into consideration for total elimination. To treat a pavement ant nest directly in a front porch may require drilling of concrete slabs, followed by an application of professional pesticide. .
Our free thorough inspection by a certified pest control technician will identify and discuss any conducive conditions that may contribute to the pavement ant infestation and provide you with a detailed solution to rid your home of the ants and keep them from coming back. .
DON’T LET THESE NEIGHBORS INVADE YOUR HOME!